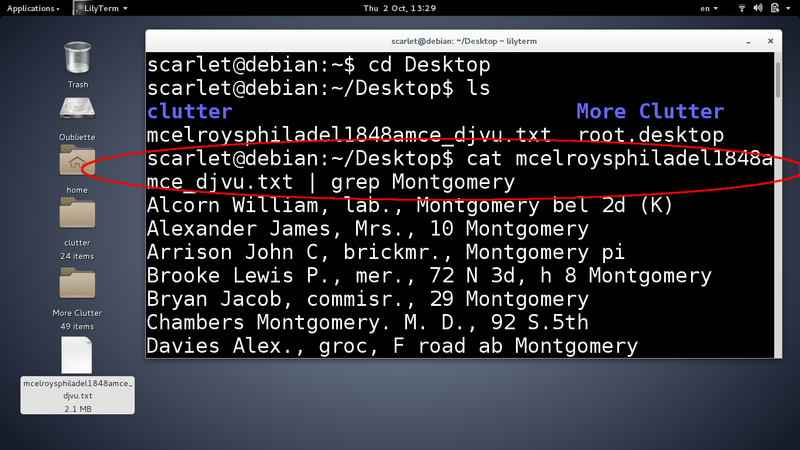 Command Line Genealogy: Filtering City Directories from Archive.org | Photo Restorations by Tim G.
The 1848 Philadelphia City Directory, filtered to show all entries that include the word ‘Montgomery’. Fear not! It’s easier than you think! 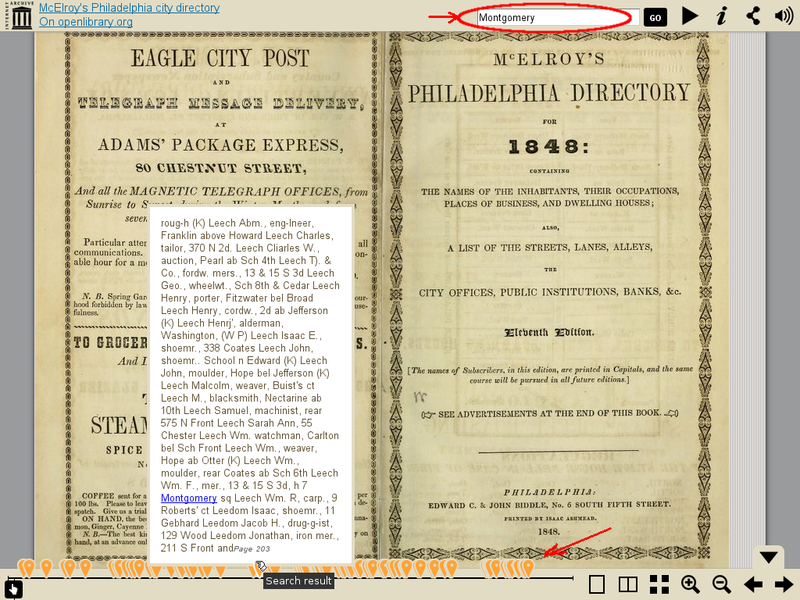 ☞ Background: I want a concise list of everyone who lived on Montgomery Avenue in Philadelphia in 1848. I have a cemetery return for a baby girl named Mary Pickersgill, who died in 1848 and was buried in the now-defunct Mutual of Kensington Cemetery, in the then-newly consolidated city of Philadelphia. I suspect she is a lost sister of my great-great-great-grandfather, who was born William Harrison Pickersgill in February of 1846. The parents of these children, especially their father, is mysterious. A Mr. George Pickersgill apparently married the children’s supposed mother, Sarah, in 1844. By 1849, Mr. Pickersgill was out of the picture. Sarah had remarried one Hugh Young that same year. Mr. and Mrs. Young appeared together in the 1850 census, along with Hugh’s family from a prior marriage, and young William, who retained his birth name. The year 1848 was a transitional one for the Pickersgill family. I would like to know with whom Mrs. Sarah Pickersgill was living at that time, but the doctor, Mr. John Uhler, was not as helpful as he could have been. He wrote that the young Mary resided on Montgomery Street, but did not trouble himself to include a house number, despite the prompt on the above form. In the absence of a house number, I wished to see a list of everyone who lived on Montgomery Street in 1848—in case any familiar names should appear. Well … wishes can come true! 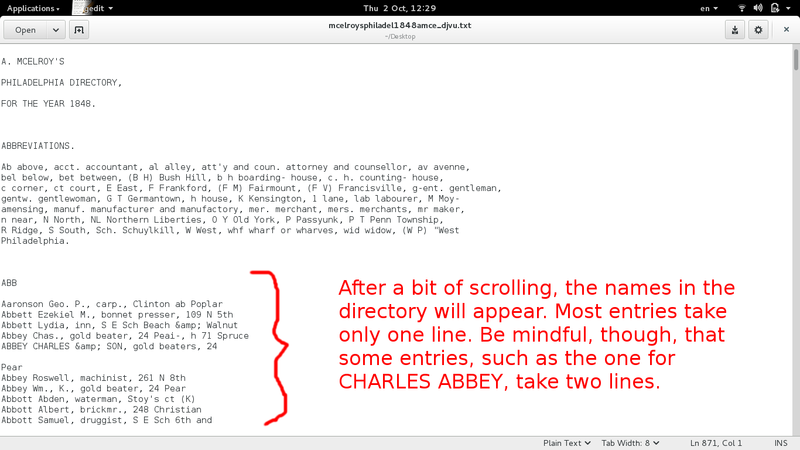 I’ll show you how to use your computer’s command line to make such a list from the digitized city directories available at Archive.org. Archive.org has quietly become a great place to acquire royalty-free public domain images for your genealogy collection. In addition to its growing collection of city directories, it also has unindexed scans of all the federal censuses through 1930. 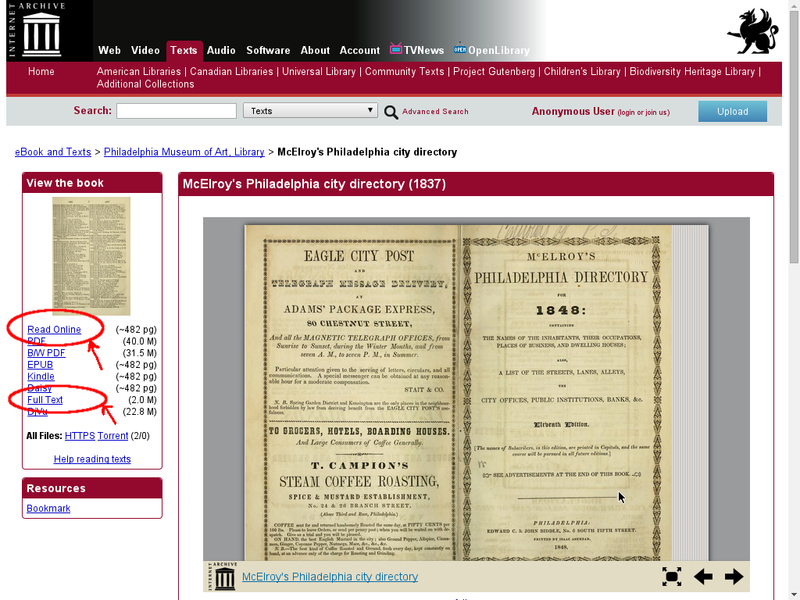 For today’s demonstration, I will use the 1848 Philadelphia City Directory. Here is a screenshot of the Archive.org home page for that publication. At this time, you can type ‘Ctrl-F’ to find all instances of the search term. Your browser should highlight each instance of the search term, and pressing enter repeatedly should cycle through each instance. This is a better way to search, in my opinion, but it still is not the concise list that I am looking for. Let’s filter this list even further. We’re ready for the next step. If you are using a Windows computer, skip on down to the following section. The principles are the same, but the commands are different. Linux users: stick with me a while. 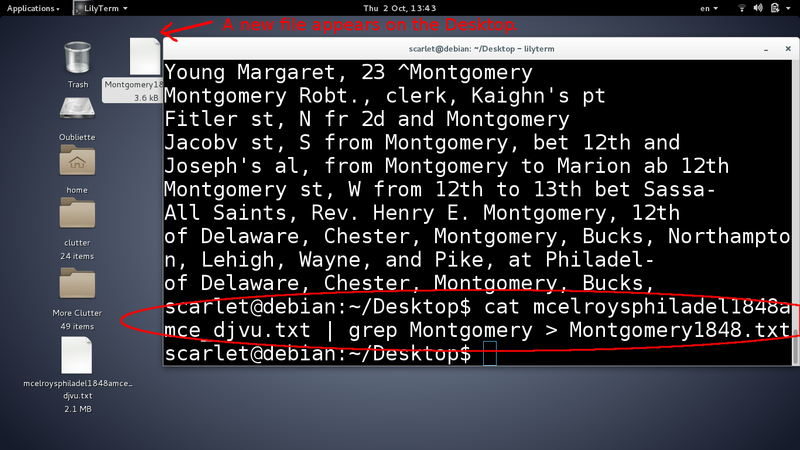 ☞ Filter the city directory file using the Linux command line. Once you are familiar with the contents of the text file, go ahead and close your text editor using the ‘X’ at the upper right. 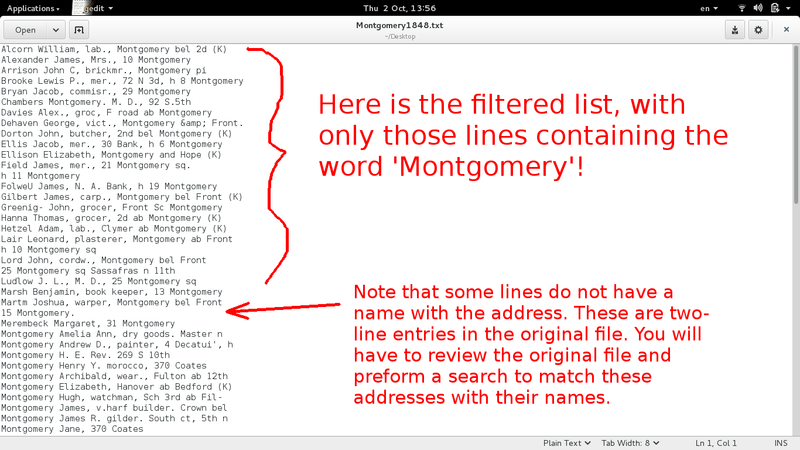 My goal is to filter this text file so to view only those lines containing the street name ‘Montgomery’. 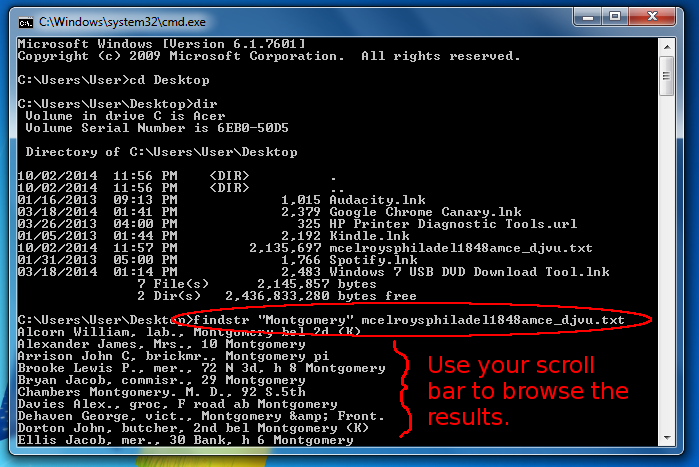 To do this I will open a terminal window and issue a few commands that interact with the city directory file. 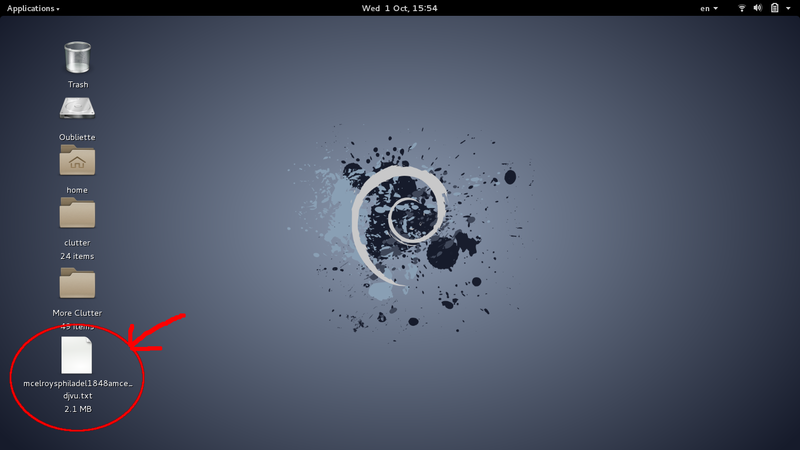 The process for opening a terminal window varies depending on which distribution you are using, but the most popular distributions for beginners, such as Linux Mint and Ubuntu, use the keyboard shortcut ‘Ctrl-Alt-T’. The terminal is also fairly easy to find under the Main Menu. Look for it under either ‘Accessories’ or ‘Utilities’. Once you open your terminal window, use the cd command to change the working directory to the location in which you saved your file. 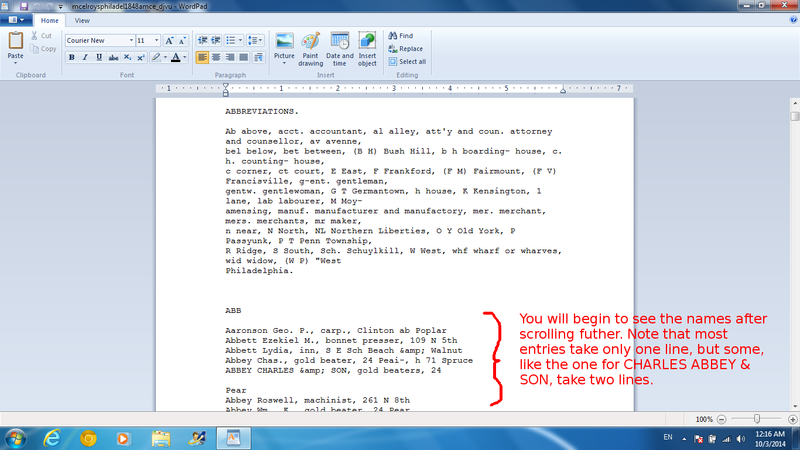 I advise saving the file to your Desktop, so you can see the results of your commands appear on the screen as you work. in this case, the full command is cd Desktop. To confirm that you have changed to the proper location, use the command ls. This command lists all of the files in the current location (which should be your computer’s Desktop). Look for your city directory text file in the output. Scroll up the terminal window if you have to. If you see the city directory file in the terminal’s output, then you are ready to begin filtering. If you do not see your city directory file, then use the command cd ~ to return to your computers home directory, and then try a different location. You may need to try downloading the file again. Once sure you are in the correct directory you can issue the commands to filter the file. The cat command will reproduce the contents of a text file in the terminal window. 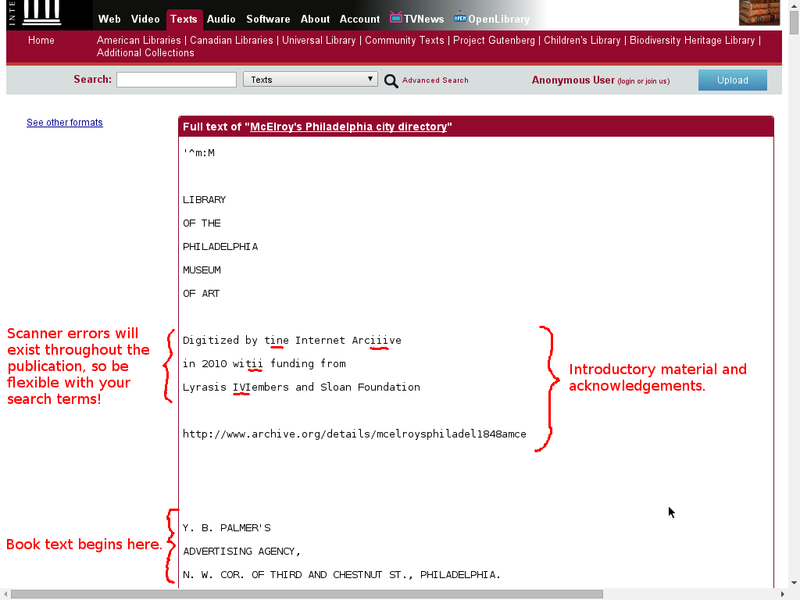 If issue that command on your city directory file, you will see the whole book whiz across the screen in a flash. This is not very useful for us by itself, but when combined with a filtering command, the computer gives us just what we need. The filtering command is grep. 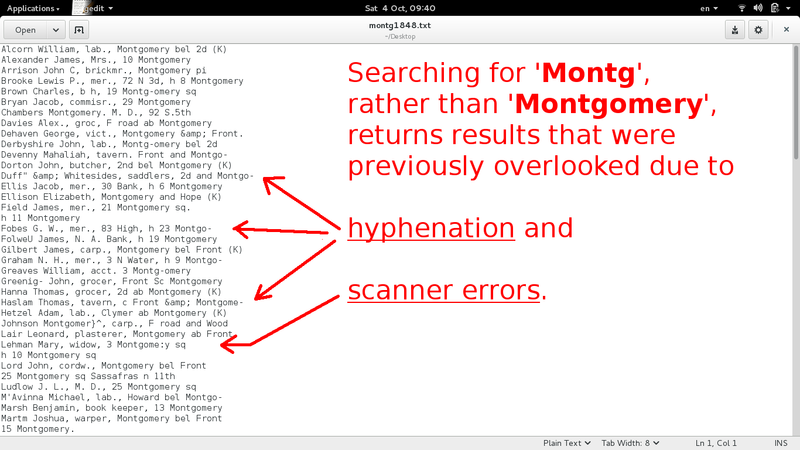 When you follow the grep command with a filtering word, such as ‘Montgomery’, the computer will reproduce only those lines of text that include the word ‘Montgomery’. I’ve circled the command I issued in red. 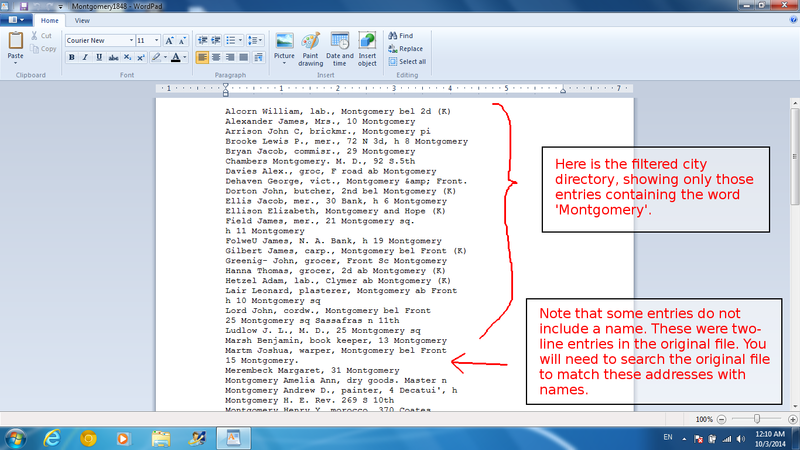 Notice below the command that the computer has filtered the contents of the city directory, and has reproduced only those lines containing the word ‘Montgomery’. Pretty cool, huh? That’s all! It wasn’t so bad, was it? 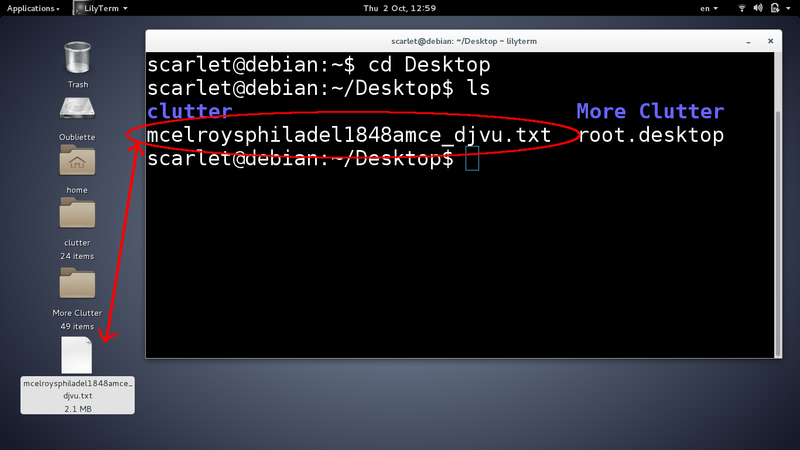 If you’ve followed me this far on your Linux computer, you may skip the next section, which details the same process for Windows users. The commands are a little different. You might want to have a look anyway. Those of you who remember the days of DOS already know a little bit about the command line. You may have thought the old DOS prompt to be a thing of the past, but that is not so! All versions of Windows, including the flashy Windows 8, have the ability to issue commands from a DOS-like command line, just like in the good old days of the 1990s. If you are running Windows 8, simply type ‘cmd‘ at the Start screen to achieve a similar result. 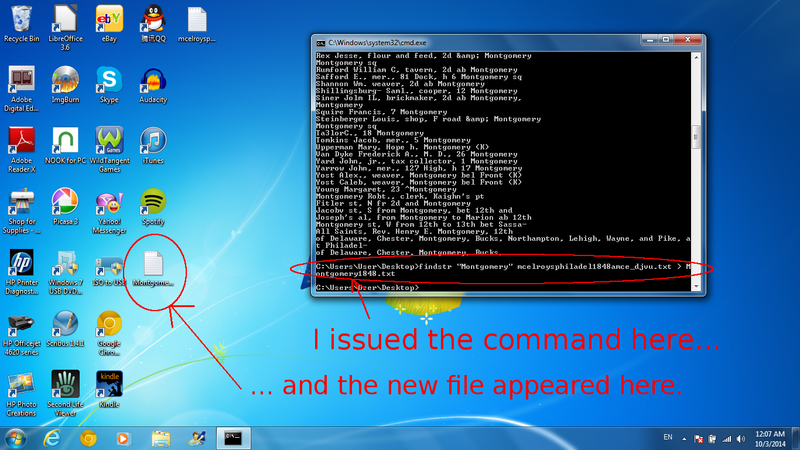 For more information on how to access the command prompt in Windows 8, see this video. Once you access the command prompt, use the cd command to change the working directory to the location in which you saved your file. 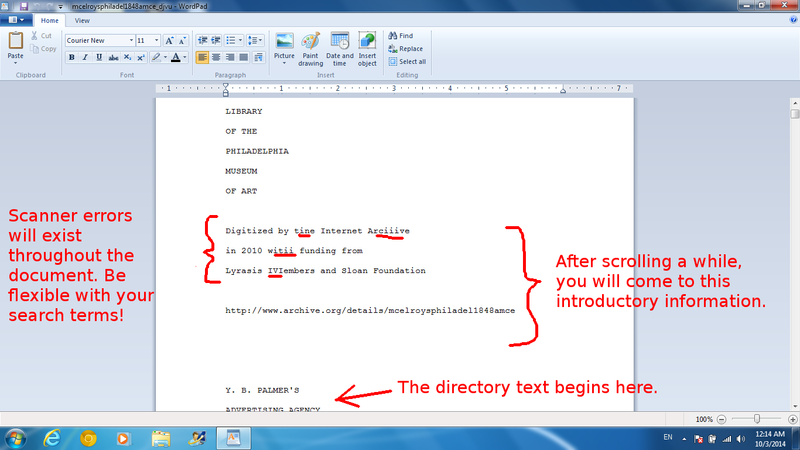 I advise saving the file to your Desktop, so you can see the results of your commands appear on the screen as you work. In our case, the full command is cd Desktop. Just type that in and press ‘Enter‘. To confirm that you have changed to the proper location, use the dir command. 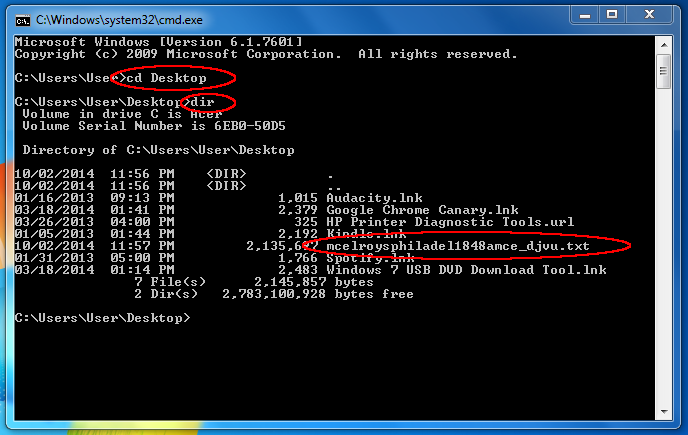 This command lists all of the files in the current location (which should be your computer’s Desktop). Look for your city directory text file in the output that follows. Scroll up the terminal window if you have to. If you see the city directory file in the terminal’s output, then you are ready to begin filtering. 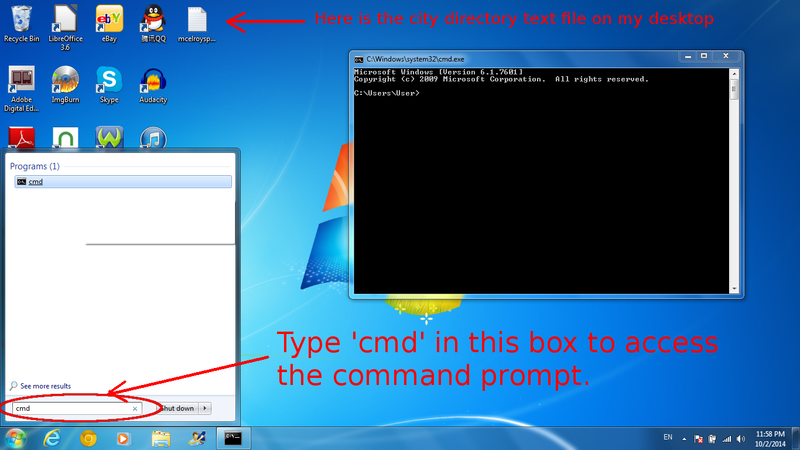 If you do not see your city directory file, then close and re-start the command prompt, and try a new location. That’s all! It wasn’t so bad, was it? 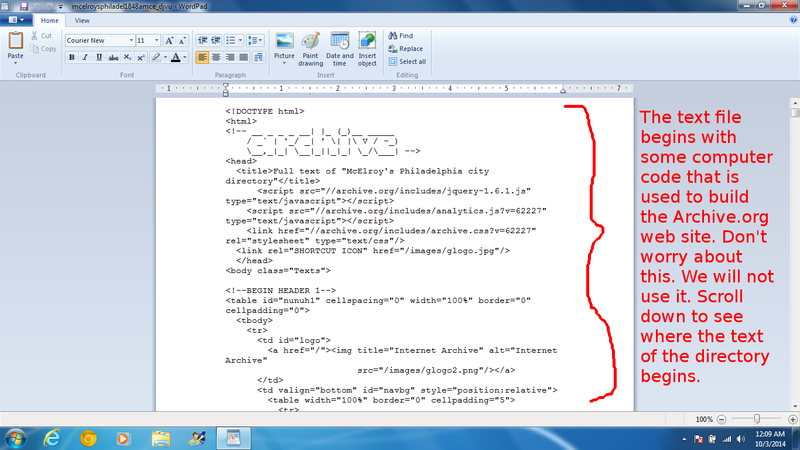 Archive.org creates text files from scanned images using software called Optical Character Recognition, or OCR. While the software greatly reduces the amount of work needed to create a useful text file, it is imperfect as a transcriber. 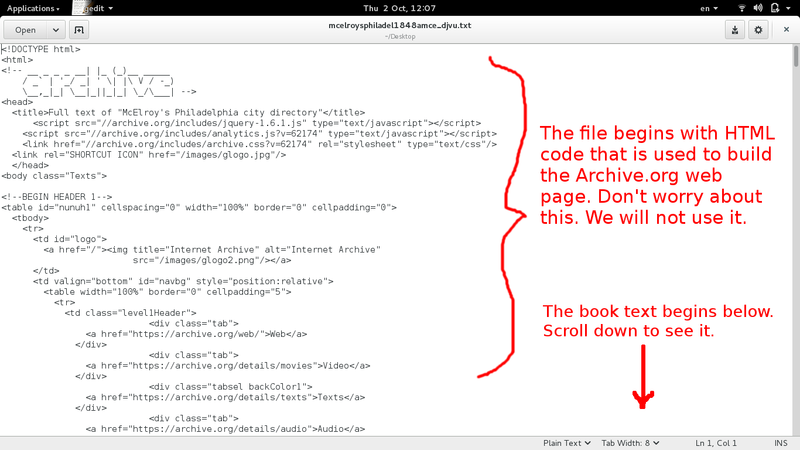 The text files at Archive.org retain many errors. Lastly, notice that some special characters will appear differently so as not to conflict with the computer code used to make the Archive.org web site. For example, the ampersand character, ‘&‘, appears in the text file as ‘&amp;‘. My advice would be to avoid using special characters in your search. If you must include them, browse the text file first to see how they are represented. If you are searching for a unique name or address, such as ‘19 Montgomery‘, or ‘Ludlow Martha‘, I believe that the the search tools available on the Archive.org web site should suffice. The results in these cases are likely to be either few in number, or concentrated on one page for easy viewing. The method I described here is best used to filter a somewhat lengthy list of persons of interest who appear scattered throughout the directory. Searching for a street name, such as ‘Montgomery’, or a woman’s first name, such as ‘Martha’ (perhaps to generate a list of potential married names), is appropriate, but using a multiple word search with these commands to find essentially unique entries seems like overkill to me. If you really must filter the city directory using a multiple word search, then the commands above will require a little modification. Again, I don’t think I’d bother, but if you must, that’s how to do it. Alas, no obvious relatives of young William Pickersgill jumped out at me after this search and filter, but I now have handy a concise list of “persons of interest” who lived on Montgomery Avenue. I hope you enjoyed this little tutorial, and that you learned a little bit about the command line in the process. If you come across any trouble filtering your city directories, remember that Google is your friend! If you still have trouble filtering, post a comment below or send me an e-mail. I’d like to hear from you! ← A Splendid Time at the 2014 Bucks County Ancestry Fair!